I have a real soft spot for George’s almost-wife. 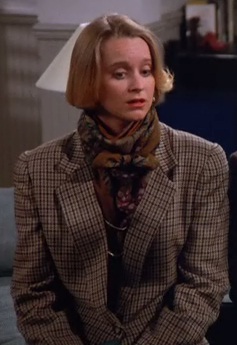 Susan, played by Heidi Swedberg, started as the only female NBC exec in the room when Jerry and George pitched their sitcom idea. She championed that idea and got it approved — she must have had quite a bit of pull to get their “nothing” concept through, given that it had gotten a chilly reception otherwise. But her tragic flaw was her taste in men: She started dating George, even though she turned out to be bisexual. With both men and women to choose from, she still opted for George in the end! Given that he had zero redeeming personal qualities, it’s hard to imagine why — except perhaps she simply had a self-destructive streak. Then (SPOILER ALERT) she died from licking cheap wedding-invitation envelopes, the ultimate insult. I like to imagine what the Susan story would look like if she were the tragic heroine of her own television show (a drama, obviously). I think it would be a metaphor for modern womanhood: A groundbreaking female TV executive with liberated sexual mores is put in her place by heteronormative culture until she is finally killed … by her own impending wedding.